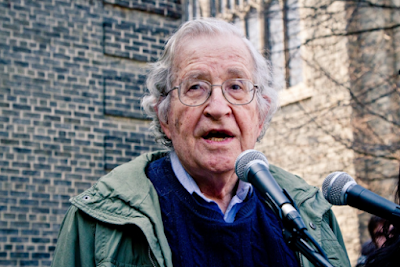 Noam Chomsky is the world’s most influential linguist. His influence can be seen in many ways, from the expansion of linguistics as an academic subject in the wake of his early work on the nature of grammars to the way in which even linguists who do not agree with him define their position in relation to his. His ideas have attracted many brilliant people to take up linguistics and contribute to the study of language. It has become common to talk of a ‘Chomskyan revolution’ in linguistics beginning in the late 1950s or early 1960s as the influence of his teaching permeated the way in which language was viewed and was discussed. If the term ‘revolution’ may be a little over-dramatic, linguistics certainly took what Kasher (1991: viii) calls a ‘Chomskyan Turn’ at that point. In this section we look at some of the major features of Chomskyan linguistics which distinguish it from earlier approaches. Chomsky is also a renowned political philosopher and activist, but while his views in the political field have been argued to be congruent with his views about language, this part of his work will not be considered here (this is covered in works such as McGilvray 2005; Smith 1999). Furthermore, since Chomsky’s ideas about language have implications for the workings of the human mind, Chomsky’s work is also regularly cited by psychologists. Again, that aspect of his work will receive very little attention here. Traditional European grammar usually gives syntax a rather minor role. To a certain extent, of course, this depends on the language being described, with descriptions of more analytic languages perforce devoting more space to syntactic matters. But descriptions of highly inflecting European languages typically have a brief section on the phonology of the language concerned, a lot of information on the inflectional morphology of the language concerned, and some relatively brief sections with headings such as ‘Uses of the dative’ or ‘Sequence of tenses’ which considered the interface between morphology and syntax. Chomsky focuses on that part of grammar which most previous commentators had simply presupposed or ignored: the ability to produce and understand sentences such as (1) (Chomsky 1965: ch. 2), to understand the ambiguity of sentences like (2) (Chomsky 1957: 88), to understand sentences like (3) even though some information is missing from them (Chomsky 1957: 66), and to perceive the relatedness of pairs of sentences like those in (4). (1) Sincerity may frighten the boy. (2) The shooting of the hunters frightened the boy. (3) John has arrived and so have I. (4) The girl has eaten the peach. The peach has been eaten by the girl. The kinds of factors that Chomsky wants to exclude in the study of language are those that divert attention from the underlying generalizations, just as would be the case in chemistry or physics. These factors are not well defined, but in principle the idea of idealization of data seems uncontroversial, and has probably always been part of the business of a linguist or grammarian, who would otherwise be faced with too much variability to be able to produce a coherent description. Linguistic theory is concerned primarily with an ideal speaker listener, in a completely homogeneous speech-community, who knows its language perfectly and is unaffected by such grammatically irrelevant conditions as memory limitations, distractions, shifts of attention and interest, and errors (random or characteristic) in applying his knowledge of the language in actual performance (Chomsky 1965: 3). Chomsky also distinguishes between the speakers’ actual knowledge of the language, which is termed COMPETEMCE, and the use of that knowledge, which is termed PERFORMANCE. The errors listed above are presumably performance errors. Any piece of text (spoken or written) represents a performance of language, which will match the speaker’s competence more or less inaccurately. Thus performance is often taken as a poor guide to competence, but competence is the object of study for the linguist. In later versions of Chomsky’s theory, the distinction between competence and performance is replaced by the distinction between I-language and E-language. I-LANGUAGE (and the I is deliberately ambiguous between ‘internalised’ and ‘intensional’ – and others add ‘individual’ and ‘idiolectal’ as well, e.g. Lyons 1991: 170) corresponds more or less to the old competence. It is what is held in the head of a single individual speaker-listener. E-language (where the E stands for ‘externalised’ and ‘extensional’) is not like performance, though. E-LANGUAGE includes languages viewed as a set of sentences, it includes the material actually produced by a speaker, it includes ‘languages’ like French and Mandarin, and it includes the objects of study of sociolinguistics and corpus linguistics. Lyons (1991: 170, 193) calls this concept ‘ill-defined and confusing’, and Chomsky himself (1991: 9) says that ‘it is doubtful that there is such an entity’. The first thing to notice about this is that a generative grammar is a FORMAL grammar. It is explicit about what is compatible with it. This is in direct contrast to most pedagogical grammars, which leave a great deal of what is and is not possible up to the intuition of the learner. In practice, this often leads to disputes about how much the grammar is expected to account for. To use a famous example of Chomsky’s (1957: 15), is Colourless green ideas sleep furiously to be accepted as a sentence generated by the grammar, on a par with Fearless red foxes attack furiously (and, significantly, different from Furiously sleep ideas green colourless, which the grammar should not generate)? If so, its oddness must be due to some semantic or pragmatic compatibility problems which are not part of the syntax. Alternatively, should the grammar specify that sleep is not compatible with furiously and that abstract nouns cannot be modified by colour adjectives (although, having said that, I have seen the expression green ideas in use, where green meant ‘ecologically sound’)? In 1957 Chomsky was clear that the grammar would and should generate this sentence, despite its superficial oddity. McCawley (1971: 219) supports this view, claiming that ‘A person who utters [My toothbrush is alive and is trying to kill me] should be referred to a psychiatric clinic, not to a remedial English course.’ Despite such problems, the explicitness of Chomskyan grammar is one of its great strengths. It has led to computational approaches to linguistics in which (partial) grammars are tested by implementing them on computer, and such approaches have implications for the eventual use of natural languages by computer systems. In principle, something is GRAMMATICAL if it is generated by the grammar, and ungrammatical if it is not. Since we do not have complete generative grammars of English (or any other language) easily available, this is generally interpreted as meaning that a string is grammatical if some linguist believes it should be generated by the grammar, and ungrammatical otherwise. Given what was said above, it should be clear that there is a distinction to be drawn between strings which are grammatical and those which are ACCEPTABLE, that is, judged by native speakers to be part of their language. These movement rules are different in type from the phrase-structure rules (also known as rewrite rules), and are called TRANSFORMASIONAL RULES. The form and nature of movement rules have changed considerably over the various versions of Chomskyan grammar, but we still have an underlying order of elements created by phrase-structure rules, and transformational or movement rules which produce the actually occurring sentence structure. The underlying order of elements was originally called DEEP STRUCTURE, and the observable output of the full set of rules was called the SURFACE STUCTURE. The term deep structure was often used informally to mean any level more abstract than the actually occurring surface form. In later versions this was reformulated in terms of D-structure and S-structure, where D-STRUCTURE is equivalent to deep structure, but S-structure differs from surface structure. Surface structure is the immediate input into the rules which provide a pronunciation of the sentence under consideration, while S-STRUCTER is the input to the semantic component, and still contains some empty elements such as traces, which are not pronounced at all. According to Chomsky (1964), grammars can hope to achieve one of three levels of adequacy. A grammar that is OBSERVATIONALLY ADEQUATE contains sufficient information to reproduce just the data on which it is based. A grammar is DESCRIPTIVELY ADEQUATE if it contains sufficient information not only to account for the input data, but to assign a structure which reflects precisely those patterns in the data that are captured by the intuitions of the native speaker. Finally, a grammar is EXPLANATORILY ADEQUATE if it derives from a linguistic theory which allows the selection of the best possible descriptively adequate grammar from those which are compatible with the data. Chomsky has consistently sought explanatory adequacy. A particularly strong formulation of the realist (sometimes called God’s Truth: Householder 1966) position in linguistics is given by Lightner (1983: 276): ‘In linguistics, there is an overriding principle – an arbiter – to judge correctness or incorrectness of theoretical constructs: if the construct corresponds to the human brain’s treatment of language, it is correct; if not, incorrect’. Except in pathological cases it is universally present in humans. Faults in the language faculty may be inherited. It is present only in humans. Language is learned extraordinarily quickly, and probably with critical periods (i.e. the faculty stops operating properly if not employed at the right period of maturation). We appear to learn far more than we have evidence for in our linguistic surroundings – this is often referred to, following Chomsky, as PLATOS’S PROBLEM or as the problem of the POVERTY OF THE STIMULUS. Despite different inputs, speakers of the same variety seem to end up with very closely matching grammars. These factors, it is suggested, make the language faculty seem much more like something with which we are biologically endowed, like the facility for sight, than like something which we learn, like the ability to do arithmetic. The argument runs, they must have, at birth, certain specifically linguistic expectations in order for them to develop a language from the impoverished data they will actually be provided with. This set of expectations or pre-programmed knowledge is Universal Grammar (often abbreviated as UG). If linguists knew the contents of UG, they would be able to work out how children learn languages so quickly, and how languages must pattern in order to fulfil the requirements of UG, and thus why a particular descriptively adequate grammar might be better than another descriptively adequate grammar of the same language. Unfortunately, UG is not available for perusal, and its form must be deduced from the actual languages we can observe. We can see the main thrust of the Chomskyan research enterprise as being the uncovering of UG on the basis of data from natural languages. 0 Response to "What Is Chomsky’s Influence"